We have great teachers here at Oxbow Academy, and this month we would like to honor Cindy Johansen. Cindy is one of our veteran teachers and has dedicated hundreds of hours to improve the academic performance of all students. Whether in her own classroom or through experiential activities, Cindy has made an impact in the lives of our students. 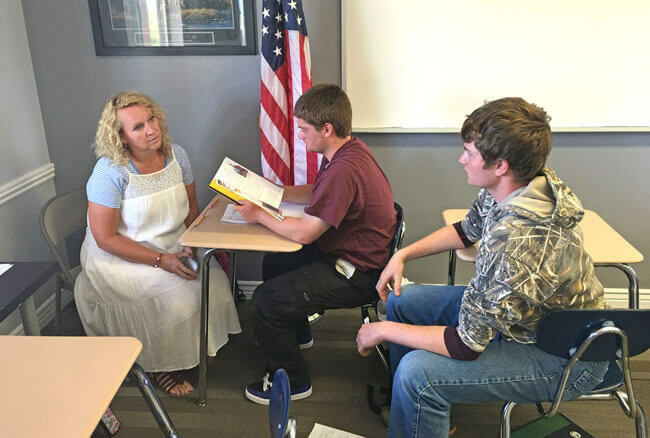 Cindy goes above and beyond what is required of her, and it is not uncommon for her to give her time and resources to improve the lives of her students. She has high expectations for each of her students because she can see their potential. They respect her and want to improve because of her efforts. “I am grateful for Cindy because she is a great individual who adds to our academic team. I know that she has been an impetus in getting several of our students to leave with diplomas. While it takes our whole staff to see these boys through to graduation, there are many who would not have left with their diplomas had it not been for her additional efforts. We are lucky to have her on our team”, as stated by our Academic Director Cindy Lindsay. “While living in Sanpete gives you the opportunity to see how others live – Cindy lives with pure goodness in her heart. I have heard of Cindy Johansen being a superstar for years, without actually knowing who she is on a personal level. She Goes above and beyond by always making time to help the student progress. She has helped numerous students succeed, in school and in life. Cindy also never lets her neighbor or friends down. Cindy goes the extra mile, and then a little bit further to put her special polish on things. Overall Miss J’s skills, attributes and talents are incredibly appreciated here at Oxbow Academy. We are grateful for all she does for our students, and the positive and funny influences she provides to those she works with. Thank you for being a huge team player, Cindy! Awww I love Miss J. She was one of my all time favorite teachers. So glad she has continued her dedications to teaching others. Love and miss you Miss J.